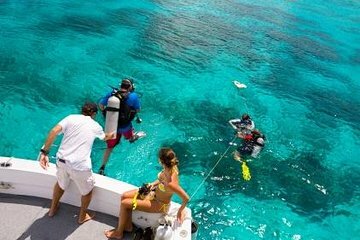 Déjate guiar por instructores certificados por PADI y maestros de buceo. Great dive! One of the nicest reefs I've seen in a while. Very healthy and enjoyable. The crew and guides were very knowledgeable and insured we had a great and safe dive. Visibility was about 40 ft and water temp was about 82 in early Sept. Also, there is no Nitrox on the islands and really you don't need it. The deepest we went was about 50 feet. Pretty shallow diving. My down time was about 45 mins on each dive and I normally go through air pretty fast. Because the reefs are so shallow the safety stops were just a continuation of the great dive. Overall, a great dive for those new to diving and those with thousands of dives under their belt. Had a great Time with FantaSea. Dove three wrecks and had a comfortable time. Uli the dive master was friendly, understanding and a great guide. Water was beautiful, boat was clean and safe...just no snacks and only water to drink...Would definitely dive with hem again! The boat captain Dana and the crew of Fantasea Bermuda were awesome. I was on the boat early and we talked about local diving, very informative. We had sunny and calm conditions which made for excellent diving. They explained what to expect on each dive site. First dive site was a Ferry that was sunk for the sole propose of diving. Some big lobsters under the boat and a fair amount for fish. Second dive site was a coral reef. Swim thru tunnel was great. Lots of snapper schools and one big grouper. I also saw a Lion fish witch Dana told me they are currently in the process of culling. I highly recommend this trip for all. Thank you Dana and crew for a great experience.